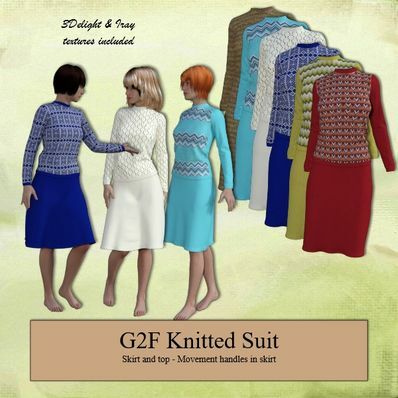 Knitted Suit for Genesis 2 Female for use in Daz Studio 4.6. Updated file has been uploaded. These work OK for me, so hope I have sorted it out this time. Happy Easter, and thank you very much! Oh dear, I thought I,d found all the bump references. I am away for the next few days, so will get them sorted, hopefully, when I get back. Hope I've got them all this time. Another updated file loaded. Sorry about all this. Resaved those files and they seem OK now, I hope. Uploaded an updated file. OK. File updated with smaller image files. Hope it all works now. @marcoio - Textures seem OK for the tops - looks fine once rendered. Why the image files are so big I don't know, but I will take a look and see what the problem is. Bump map is named differently, so I will rename that. I'll leave the item up for now, until I get the rest sorted. Hi, Wendy, thanks for the beautiful outfit. I found some issue using 3DL materials (I don't use Iray, so I don't know if Iray materials have same issues): - In skirt, using Knitted Skirt 2, 3, 4, 5, and 6, DS warns a missing Skirt Bump.png - In top, using Knitted Top 1, 2, 3, 4 and 6, it loads a weird texture (it seems the same of the skirt) and sometimes a dialog pops up saying that there was an error loading file. I see that texture files are way bigger than usual... could be this the problem? Thank you so much especially for keeping gneiss 2 going. Thank you! This is so nice! Great skirt length! This looks beautiful. Thanks so much for continuing to support G2F!! Wonderful outfit! Love the subtle folds in the top and skirt. The length of the skirt is perfect! Thank you so much for the various colors and patterns. You're the BEST! A big THANK you! Love your work!